Pictured are some of the “Big Wheels” who served during the 2017 event. EATON — Preble County Council on Aging (PCCOA) will be participating in the 16th Annual March for Meals – a month-long, community-by-community celebration of Meals on Wheels and the vulnerable seniors who rely on the vital service to remain independent at home. 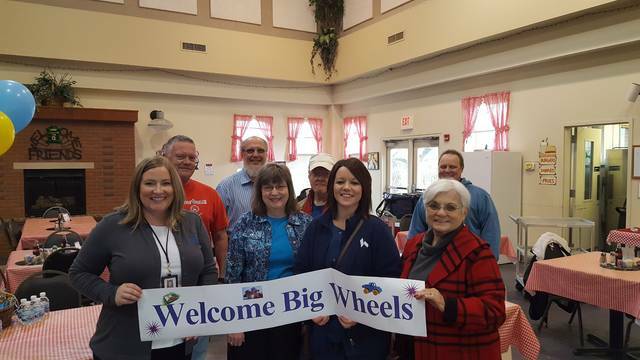 PCCOA’s celebration will include various activities throughout the month of March, including Big Wheels deliver meals week, March 19-23. During this Big Wheels week, members from the community ride along with our Home Delivered Meals drivers to help deliver hot nutritious meals to seniors. PCCOA delivers approximately 134 meals a day to seniors throughout Preble County. We make each nutritious meal fresh every morning, and the meals are delivered hot to them for lunch. In addition to delivering a hot meal, our drivers help with small tasks, such as bringing in mail or taking out the trash, as well as a general wellness check and a friendly visit. “In 2017, we delivered 29,733 home delivered meals (HDM). We are excited to be a part of the National March for Meals Campaign,” said Ashley Workman, In-Home Services Manager. To help ensure that Preble County seniors are not forgotten, we have a Sponsor-A-Senior Program. This program helps to eliminate senior hunger in Preble County, and allows us to feed the 40-plus seniors that are currently on our waiting list for meals on wheels. According to Meals on Wheels America, “A senior who receives daily-delivered meals experiences the greatest improvements in health and quality of life compared to a senior who receives, weekly delivered meals or no meals at all.” Plus, “A senior who lives alone and receives daily-delivered meals is less likely to worry about being able to remain at home and to have feelings of isolation and loneliness.” You can sponsor-a-senior for as little as $50.00 per month, or $600.00 per year. If you are interested in participating in this program, call Shelley at 937-456-4947. For general information about what all we offer stop by or call. https://www.registerherald.com/wp-content/uploads/sites/41/2018/02/web1_Big-Wheels-Week-20172018218131129312.jpgPictured are some of the “Big Wheels” who served during the 2017 event.